Using the healing properties of water, heat and steam to absorb herbs into the body and open passageways. An herbal bath is like immersing yourself into a big pot of tea. The warm water opens up the pores of the skin allowing it to absorb the medicinal properties of the herb, while also eliminating toxins. I find this the easiest way to administer herbs to my children. Here are a couple of ways to prepare an herbal bath. Tea Bag Method: Fill a muslin bag with the herb(s) of choice and tie up. Hang over the faucet as the hot water fills the bath, then throw it in the bath water while bathing. Alternatively you can also place the herb in a wash cloth, handkerchief, or nylon stocking and tie up the ends, throw the bundle into the bath water. 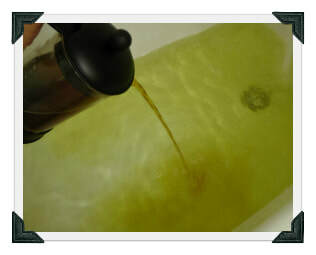 Herbal Infusion Method: This is my method of choice and my kids love it because it changes the color of the bath water. Just make a very strong herbal infusion, strain, and pour the tea into the bath. For baths I use a french press and fill the container 1/2 full with herbs (pictured to the left). Loose Herbs Method: This can be messy, but fun. Throw your herb(s) of choice right into the bath water, the heat from the water will extract the properties into your water. When you drain the tub the herbs will stick to the sides and bottom, just wipe out with a cloth or towel. A foot bath is more concentrated than a bath and sometimes easier to administer than a full on bath. The feet have the largest pores of the body therefore absorbing the herb quickly into your body. Fill a basin, bucket or tub (I just use a sweater size bin) with water as hot as you can stand. Use the same methods as above to prepare the herbal foot bath. I always add essential oils to the bath as well. Steam inhalation is good for opening the sinus and respiratory systems. It is also used for facials since steaming gives the skin a deep pore cleansing, while nourishing and toning the skin. After a facial, immediately rinse your face in cold water or spritz with an herbal hydrosol, then pat dry. Heat a large pot of water until it is steaming. Add herbs of choice: good ones for decongestant are peppermint, lavender, thyme, and rosemary. I throw in about a handful. Set the pot on a table, be careful it is hot. Lean head over the pot and cover with a towel. Inhale the steam for 5-10 minutes. I talk about how much I love the book The Herbal Kitchen under the Other Methods page but I have to mention there is a recipe section in the back of the book just for Herbal Foot Baths and Soaks that are fabulous.